Home / Review / Can you keep it down? Voice Monsters on the Prowl! Can you keep it down? Voice Monsters on the Prowl! So I have to admit, I don’t really like pediatric voice therapy. I don’t know why. I got A’s and loved all my voice classes and voice clients in grad school. I voluntarily got some CEUs in pediatric voice therapy after college. But I never quite felt about it the same way I feel about language therapy. So needless to say I could always use some help when searching for materials for pediatric voice clients. 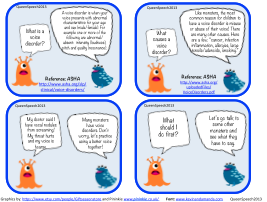 That’s why I was so excited when I got the opportunity to review the “Voice Monsters” created by Rachel Osborn of The Queen’s Speech Blog. Rachel has created this voice therapy techniques packet to target clients with vocal nodules. However, the materials in this packet are applicable to clients with a number of different voice diagnoses (e.g., vocal hyperfunction, functional dysphonia, etc) provided of course these clients have been seen by an otolaryngologist and have been cleared to receive vocal therapy). So what does this 37 page packet contain? Targeted for children ages 4 and above this packet provides explanation of voice disorders as well as tips on vocal hygiene for kids. Interestingly both the explanations on page 4 and the tips on vocal hygiene on pages 5 and 6 are actually a perfect way to present the information to parents. However, given the complexity of the language on the first two cards on page 4 (e.g., abnormal, characteristics, intensity, causes, inflammation) you might need to simplify this information for the students (especially for younger children) to adjust the language to their level. 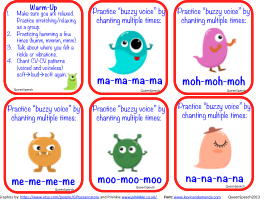 The next set of cards explains the yawn sigh (pages 7-20) and the ‘buzzy voice’ (pages 20-30) techniques. 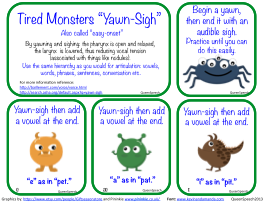 The yawn sigh technique cards are very easy to understand and what I particularly like about them that they are arranged in a hierarchy of vowels, words, and sentences. I like the fact that Rachel included blank cards so you can create our own sentences. She does a similar hierarchy of sounds, phrases and sentences for the ‘buzzy voice’ technique as well. I also like the fact that Rachel included some fun activities into her pack in addition to the exercises. 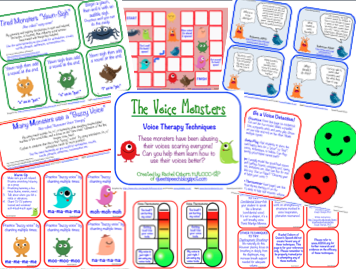 There’s the quiz which reviews things that can hurt and help you voice, the voice detective game for good and bad voice habits, as well as a voice thermometer to help students monitor their vocal volume. There is even a generic game board for practicing a variety of tasks. Finally, I really like that fact that Rachel includes information on other voice exercises as well as links to videos and other useful resources. There’s just so much you can do with these activities, and the adorable graphics make it both fun and functional for the children to participate in therapy. The best part of me was that in addition to the materials being functional I didn’t have to spend any effort on “cutefying’ them for my clients, and that’s definitely a huge plus in my book. You can grab this cute and functional activity in Rachel’s TPT store for as little as $4.00. For more information check out Rachel’s blog, The Queen’s Speech and don’t forget to follow her on Facebook! Previous post: Language therapy for children with severe cognitive impairments: Focus on Function!